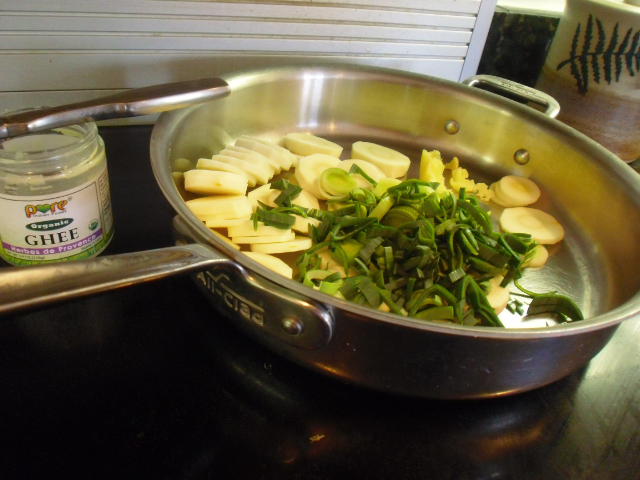 Parsnips and Leeks Vegetable Side Dish Recipe - Hartke Is Online! Despite my husband’s raised eyebrow, I bought a handful of parsnips last week at the Maple Avenue Market, a wonderful new local foods market in Vienna, VA. Keith is always leery of vegetables he has never heard of, but I assured him he would be fine with the parsnips. Here is a recipe that I came up with, easy and very tasty. It won Keith over to the parsnips camp! Melt ghee (which is clarified butter) in large frying pan. Add sliced parsnips and leeks. Saute over med. low heat until parsnips are cooked through, turning frequently. The parsnips may be slightly browned on the edges. Serve as a side accompaniment to your meat dish. 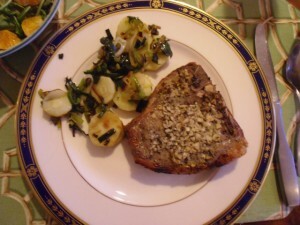 See last weeks post, Wet Rub for Pork to make these luscious Italian style pork chops! This post is part of the Real Food Wednesday blog carnival. See more tempting, healthy foods at Kelly the Kitchen Kop. I have never had parsnips either. Kimberly, this recipe has motivated me to try them! I’ll pick some up from my local farmer’s market. Pure Indian Foods ghee is a wonderful product. .-= Stanley Fishman´s last blog ..Energizing Egg Recipe: A Nutritional Powerhouse =-. Add one sliced carrot and substitute smoked bacon grease for the ghee. I have made this the last two nights and it was equally delish! Sounds good Kim, I’ll try both of them!